The World Cup may have come to a close over the weekend after what has been, by all accounts, an epic tournament, but for football / soccer fans, it was only a precursor to the season upcoming. We’re approaching that time of the year when, for Europe and many other parts of the world, the games are about to commence, and on cue, the launch of the new FIFA title. Lionel Messi, Argentina’s talisman, may have just missed out on the sport’s most coveted prize, but he can take some solace in the fact that as well as scooping the official award for best player, he’s also the face of FIFA 15. FIFA has become something of an institution among football fans across the globe, and although Pro Evolution Soccer was once a staunch rival in the battle of the footy sims, FIFA has since been crowned the de facto king of this particular category. Almost every year, EA outdoes itself in improving graphics, introducing cutting-edge gameplay, and generally enhancing what is one of its most popular sporting outlets. This time around, Leo Messi will feature as the player on the cover, and although Ballon d’Or winner Cristiano Ronaldo will surely feel a little hard done-by at this decision, there’s no doubting Messi’s pedigree as a worthy face of such an iconic franchise. Messi is no stranger to seeing his face on the cover of FIFA, having already featured on several occasions in the past. But given how he is, in the eyes of many including FIFA president Sepp Blatter, the best player in the world, this should come as very little surprise. 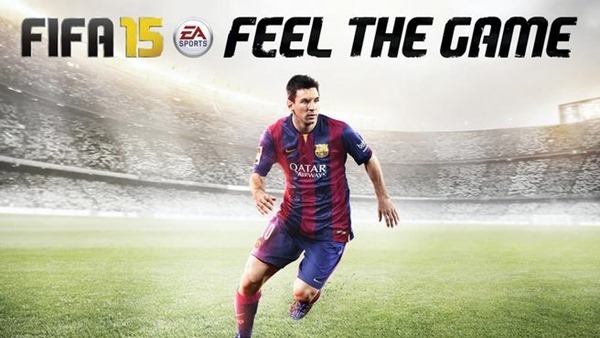 As for the title itself, FIFA 15 will include the usual spate of improvements, with avid football fans looking to get their fill via online multiplayer as well as the very popular Manager Mode. Indeed, EA has packed some 600 new emotional reactions and quirks, making the game feel more real than it ever has, and as an added bonus, players will also be able to recall, and thus react, to in-game incidents as they would on a real football pitch. The title will launch on September 23rd in North America, arriving two days later in Europe before dropping in the UK on the 26th, and as always, we’ll have all of the details on those key dates so you don’t miss a trick.